After being in the U.S.A. for 5 weeks (what was supposed to be 3) we returned home Monday morning. This is the first chance I have had to write a post and it will be a quick one. We knew when we arrived home that we would have to hit the ground running. No time to rest as we are hosting Thanksmas tomorrow. We needed to do general housekeeping things and after the house being closed up for five weeks, it needs a bit of airing out so we are happy that we are having warm (enough) weather to open the windows. There was grocery shopping to be done, twice. Once on Monday for the very basics and then additional trips to get all the goodies for tomorrow. There was also laundry to be done, thankfully not much as I tried to keep up with it while we were at my cousin’s house. Oh, the unpacking and putting things away had to be done. We needed to get firewood. 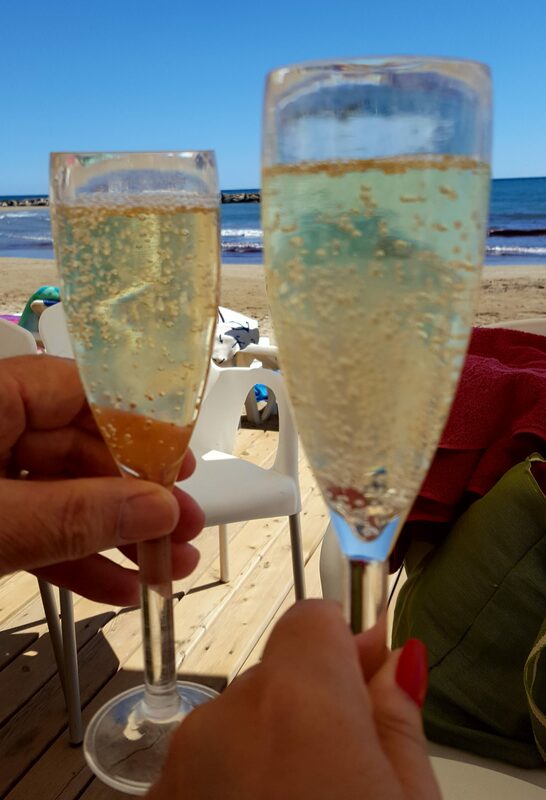 Thankfully the trip to get firewood was followed by meeting Mark on the seafront in Vilanova for a couple of glasses of cava so we could catch up. We needed to take some things to the dry cleaners (and pick up two days later) as everything will be shutting for Christmas vacation. We took Bob’s watch to the jewelers for a new battery as it had stopped working when we arrived in the States and the jewelers there said they would have to send it away for 2 weeks. We needed to get a Christmas tree. We needed to decorate the house for Christmas, even though it is only a couple of days away. We needed to get some wine. We needed to pick up the turkey for Thanksmas (thank you to Kim for ordering it from Mitjans in Moja for us). Today was our writer’s group meeting where we wrote about the Winter Solstice. It was great to be able to stop for a short time and write as it has been too long since I have done that. A bottle of cava got the creative juices flowing. Afterwards, we went to lunch together so a wonderful day with friends. 🙂 Back home and still things to be done tonight. Now…all of this was made all the more fun by the fact that last Saturday I fell down the stairs at my cousin’s. I was carrying some laundry downstairs and a piece of it fell out of my hands and unfortunately, the next step I took was onto it. Down I went on my bum, back, elbow and head. Nothing broken and thankful that I fell backwards but I am walking wounded right now. Bruised, stiff and sore so everything I needed to do took all the more effort to do. Bob has been wonderful doing all the things I can’t or shouldn’t be doing but it sure is difficult to ask for help and accept it. This too shall pass. So, having been home, less than 5 days, we have accomplished a fair bit. We are looking forward to seeing our friends tomorrow and having a belated Thanksgiving feast. Sunday, we may just curl up on the couch and watch movies. Home…there’s no place like it. I winced at your fall! Hoping you recover well. Am glad you are writing again and are home.